On Tuesday evening, February 24th, 150 students met on the second floor of the University of Pennsylvania Hillel building to participate in a global initiative to honor the memory of eight yeshiva boys who were gunned down by an Arab Israeli terrorist a year ago. The tripartite memorial was very much tailored to honor those boys, all of whom were on their way to study, or were already studying, Torah in the library of the Merkaz HaRav Yeshiva in Jerusalem when they were murdered. Tens of thousands participated in the worldwide Torah learning initiative. Participants hailed not only from the United States, Canada and Israel, but also from Berlin, Hong Kong, Helsinki, Warsaw, Paris and other improbable locations. 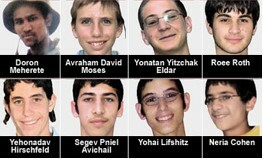 The eight students at Yeshivat Merkaz Harav who were massacred March 6, 2008 by a Hamas terrorist. Another - actually the impetus for the entire project - component of the memorial project was the commissioning and then donation of eight Torah scrolls, one to honor each of the slain boys, by an anonymous donor. When the studying was complete, on the day of the yahrtzeit, the final component of the memorial took place: a world wide “siyyum,” which is a celebration held at the completion of the study of a unit of Torah. 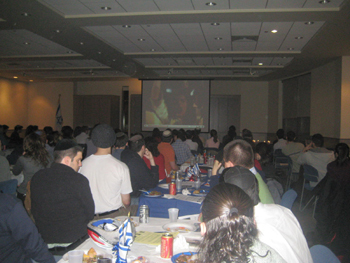 Those who gathered at Penn that night to mark the siyyum participated in a celebratory meal which is traditionally held to mark such an event. While the meal may have drawn some to the event, everyone was deeply moved. As the event began, Yu Chen, a strapping Penn junior, sat eating his dinner at a table near the back of the room. Chen, Asian, with bulging muscles and a bare head, was noticeable in the crowd, although only two thirds of the men had their heads covered. During the moving and inspirational overview given by Kiderman, I noticed Chen push away his plate and put his head in his hands. When the videos of the massacre and of the ceremony ended, Chen’s eyes were glistening. I went over to talk to him. During the siyyum in Jerusalem, the eight sifrei Torah were handed one to each of the families of the slain boys, and a member of each family completed the scrolls by inscribing the final letters. With the presentation of the holy scrolls, and the conclusion of the ceremony, vibrant music soared over the crowd which broke into joyous dancing. Many in the crowd wore black hats, but at least as many of wore knit kippot (yarmulkes), and a few even wore fabric-covered dreadlocks. The Penn celebration followed the same pattern: at the completion of the speeches and videos, the students chanted the Mourners’ kaddish (prayer said by those in mourning), then joined arms, and danced and sang. 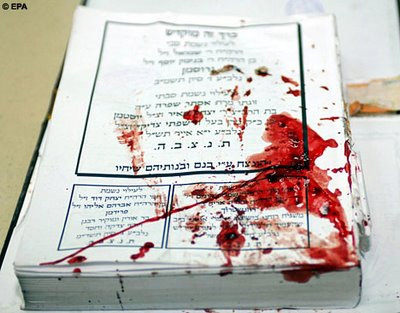 The boys who were murdered last Rosh Chodesh Adar, 5768, March 6, 2008, were: Neria Cohen, 15, Segev Pniel Avihail, 15, Avraham David Moses, 16, Yehonatan Yitzhak Eldar, 16, Ro’i Roth, 18, Yohai Lipshitz, 18, Yonadav Chaim Hirshfeld, 19, Doron Mahareta, 26. May their memories be a blessing. A book written by fellow students about the victims, Princes Among Men: Memories of Eight Young Souls was just published in English. To view previous editions from our Israel section, please click here.